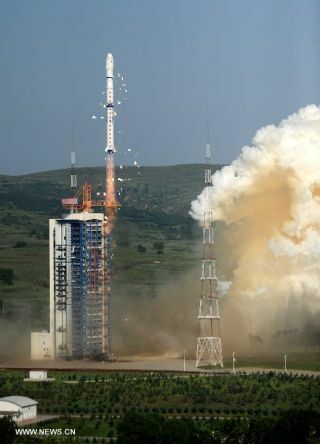 China rocketed the Chuangxin-3, Shiyan-7 and Shijian-15 satellites into space on July 20, 2013 from the Taiyuan Satellite Launch Center in North China's Shanxi Province. The trio of satellites is reportedly being used mainly for conducting scientific experiments on space maintenance technologies. A set of three mysterious satellites has experts guessing about the Chinese space program's intentions. No one really knows what the Chinese are up to, and everything is speculation. That appears to be the consensus of space experts tracking a set of Chinese spacecraft. Some have speculated that the Chinese are testing possible anti-satellite technology, while others have described the satellites as prosaic probes meant to sharpen the country's overall space skills. One of the trio of new Chinese satellites, Shiyan-7 (SY-7, Experiment 7), has since made a sudden maneuver. That satellite had already finished a series of orbital alterations that put it close to one of the companion satellites with which it was launched, the Chuangxin-3 (CX-3). "Suddenly, however, it made a surprise rendezvous with a completely different satellite, Shijian 7 (SJ-7, Practice 7), launched in 2005," noted Marcia Smith, a space policy analyst and founder and editor of SpacePolicyOnline.com. China's FENGYUN 1C polar-orbiting weather satellite was destroyed during the test of a Chinese anti-satellite weapon in 2007. Analytical Graphics created an animation from which this still was taken using data tracks of the debris in June 2007. Christy could not confirm at the time which of the three satellites carried that arm. When the three satellites were hurled skyward in July, the Chinese language press specifically discussed "space debris observation," "mechanical arm operations" and the testing of "space maintenance technologies," said Gregory Kulacki, a senior analyst and China project manager within the U.S.-based Union of Concerned Scientists' Global Security Program. "This suggests one possible project for the mission is the experimental collection of space debris," Kulacki told SPACE.com. The recent July 20 launch also resembles the lofting of the Changxin 2 and the Shiyan 3 satellites in November 2008, Kulacki said. Changxin 2 was an Earth observation microsatellite, while Shiyan 3 was an experimental spacecraft designed for space weather experiments, he said. The mystery surrounding the recent launches fits the Chinese pattern, said Dean Cheng, a research fellow on Chinese political and security affairs at the Heritage Foundation in Washington, D.C.
Close proximity maneuvers, like that between the two Chinese satellites, are consistent with a range of possibilities, from the benign (docking, refueling and repairs) to the malign (anti-satellite), Cheng told SPACE.com. "But it is perhaps useful here to recall that the People's Republic of China remains intent upon establishing space dominance as part of their thinking about 'fighting and winning local wars under informationized conditions,'" Cheng said. And, even as the Chinese call for greater military-to-military contact with the United States, it's true "that they remain opaque, and that they pretty much refuse to engage the U.S. on military space issues." That is, while China expands its space capabilities, the country is likely just as interested in military capabilities for their expanding array of space systems as it is in peaceful functions, Cheng said. "Since space systems are largely dual use, it should not be surprising that there would be interest in the ability to maneuver satellites in close proximity … but neither should there be blithe assumptions that this is necessarily for solely peaceful ends," Cheng said. An anti-satellite (ASAT) capability allows a country to render a satellite non-operational, Smith wrote. "China conducted an ASAT test in 2007 when it launched a satellite interceptor against one of its own satellites. The test was successful in that it destroyed the satellite, but the resulting cloud of more than 3,000 pieces of space debris in a heavily used part of Earth orbit resulted in international condemnation, and spurred efforts to develop an internationally accepted code of conduct to ensure space sustainability," Smith said onSpacePolicyOnline.com. But both China and the United States are experimenting with close-proximity maneuvers in space, said Michael Krepon, co-founder of the Washington, D.C.-based Stimson Center and director of its South Asia and Space Security programs. Both nations have demonstrated ASAT capabilities, Krepon told SPACE.com. Information derived from actual or purported tests for ballistic missile defense, he said, can also be applied for ASAT purposes. "Beijing and Washington have a choice to make, the same choice that Moscow and Washington faced during the Cold War," Krepon said. "Major powers can ramp up a competition to damage satellites, or they can arrive at tacit agreements to dampen this competition," he said. "The United States and the Soviet Union chose wisely. China has yet to choose."